The City of Hawthorne elected its first Black mayor in 91 years on Nov. 5 when relatively unknown and political novice Chris Brown defeated embattled incumbent Daniel “Danny” Juarez and Jose Gutierrez winning 39.48 percent to 30.93 percent to 29.60 percent, respectively. Brown, 32, represents a bold new generation of young public servants following in the mold of Compton Mayor Aja L. Brown (not related), Lynwood City Councilmember Jose Solache and leading Assembly candidate Sebastain Ridley-Thomas. 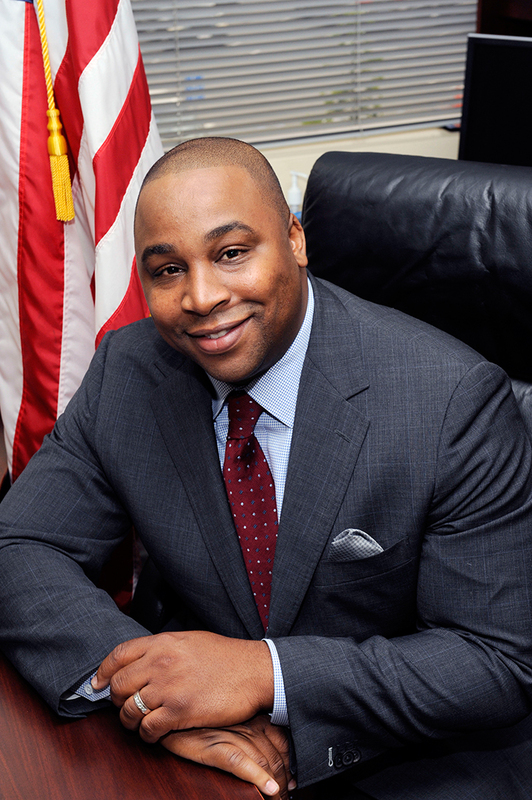 “I think the residents are looking for leadership, they are looking for young fresh ideas and young bright passionate and exuberant leadership that is being reflective throughout America,” stated Assemblymember Isadore Hall III who mentored the new Hawthorne mayor. The Los Angeles native, Brown was graduated from Fairfax High School where he was a member of the football team and is a product of a single family home. His mother Zina Willingham is a breast cancer survivor who raised him and brother Kidy Willingham, a pastor in Houston, Texas, on welfare. 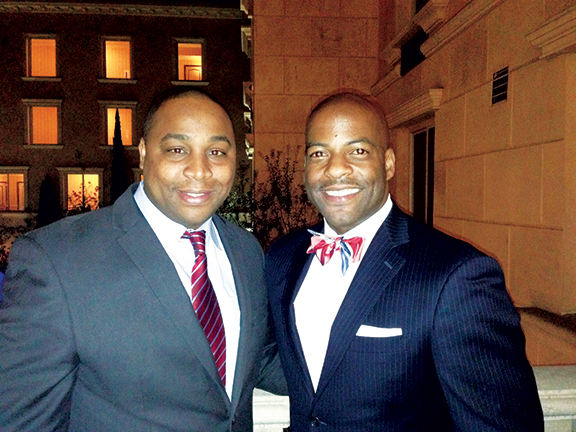 At a very early age, Brown remembers having to go out and secure work to help his mother and the early labor was instrumental in leading to a BA degree in sociology from National University and successful account executive careers at both AT&T and Nextel. “My mom was a single mom who raised two boys. My mom pretty much took two young men under her wings and made things happen. I started working at a young age and I knew that I had to help my mom because she couldn’t do everything on her own,” said the Mayor-elect. Brown says that his mother is everything to him. He lost an aunt and his grandmother to cancer and it has been their influence, which he credits with making him the family man and person he is today. Married and the father of a three-year old son his family lives in Hawthorne. The delegate for President Obama in 2012 who is small real estate business owner, he had no idea that one day he would be making history himself. However, there he was seven days following the election speaking to the Sentinel and basking in his own bit of history. “It’s starting to settle (the historical fact of becoming the first Black mayor) since going out into the community I am pretty much attached to the situation. The city is starting to understand the changes of being out of old leadership and are happy for new leadership,” he stated. Brown becomes the second Black mayor in the South Bay joining Inglewood Mayor James Butts and he anticipates the two cities working together down the road for the betterment of Hawthorne. “I will have to lean towards mayor James Butts obviously because he has a lot of development in his city right now. We are neighboring cities and I think that it’s important that we share ideas that can be beneficial to us,” he added. Hawthorne has a population of 87,000 residents with Latinos making up the majority 52 percent and Blacks second at 26 percent, a consistent demographic that mirrors surrounding cities. “I think it’s exciting to know that some young leadership is taking fold. 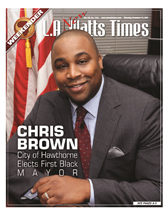 Chris Brown is the right person at the right time to be mayor of Hawthorne. We need more Black and Latino leaders,” explained Lynwood Councilman Solache who is 33. Much of the credit of the shepherding in the new young leadership goes to Assemblymember Hall who was also responsible for Solache and Aja L. Brown in Compton. “Isadore is unique. Isadore is a leader that believes in young leadership. He gave individuals like myself an opportunity to make a difference so this is really an important step in moving our society and our generation forward to bring in the new,’ mentioned Brown. Compton Mayor Aja L. Brown also praised the political wisdom of Assemblymember Hall.